The Light of Life magazine is primarily available in print form which is sent by post at the beginning of each month. The full magazine is now available in a digital form in the PDF format which can be downloaded from this web site. 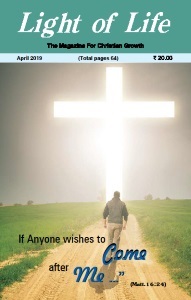 The current issue is for April 2019. You may subscribe to the print version or the PDF version for only Rs. 200 per year. Just write to us to receive a free sample copy of the print version. A sample of the PDF version is available (Click here). Our web archive provides for your reading the editorials and a few articles from each issue from 2008 to 2014. This web site shows the list of contents for each month beginning from January 2015. You may also wish to order books and other items from the Light of Life Book Store.